Leadership development for everyone in the blue collar workforce, those who support them, and those who lead them. Leadership is influence. Influence is built daily, not in a day. There are two types of influence: 1) Artificial influence which comes with a title, position, or rank and is reserved for those who have formal authority over others; and 2) Authentic influence which is based on a person's character and the relationships they build, and it's available to anyone with or without a position of authority because it's based on moral authority (who you are and how you do what you do). 111: The 5 Levels of Leadership plus an Intro to Blue-Collar Leadership & Supervision. Before Mack kicks off the upcoming 30 part series on his book, Blue-Collar Leadership & Supervision: Unleash Your Team's Potential, he wants to share some thoughts from his #2 all-time favorite book, The 5 Levels of Leadership, by John C. Maxwell. In this episode, Mack will briefly review The 5 Levels of Leadership and introduce the upcoming series on Blue-Collar Leadership & Supervision. You'll discover what the 5 levels of leadership are, how to climb from one level to the next, and why it's important to know about each of the levels. In this episode, Mack will discuss the importance of leadership development, The Transformation Equation, the event versus the process, and he will share a few leadership development/training strategies. Visit www.GetTheTransformationEquation.com for a pdf version of much of what is presented in this episode. Leadership development is personal and professional development geared toward helping someone develop their character and increase their authentic influence not only within themselves, but also with others. Without a transfromational leader, there won't be a cultural transformation. Transformation doesn't just happen. It takes a transformational leader to create transformation, first in themselves, then in others. Many organizations face three major dilemmas: engagement, retention, and turnover. These three dilemmas make it hard to be competitive. The only reason a company experiencing these three dilemmas can compete with others is because their competition is also facing the same dilemmas. Once a competitor addresses and effectively eliminates these dilemmas, their competition will be forced to step up or step down. If they don't step up, they will be left behind by those who do. 108: 7 signs it's time to promote your boss. In this episode, Mack will share 7 signs that indicate it's time for you to promote your boss. It doesn't mean give them a raise or a new title or position. You can't promote your boss in that way. However, you can promote them in another valuable way. You can give them positive "word of mouth" advertisement by expressing appreciation and gratitude for them to others. You can tell their boss how great they are...but only if they truly deserve it. Promoting the boss isn't about you trying to get ahead. It's about you trying to help the boss get ahead because they deserve it. In this episode, Mack shares 7 signs that indicate it's time to consider firing your boss. Yes! You can fire your boss. Mack has done it. How do you do it? You quit and hire a new boss. Just as you can be hired and fired by the boss, you can also hire and fire the boss. The turnover rate is often an indicator of how many people are firing their boss. If people are leaving on a regular basis, they're firing their boss. The key to being able to effectively fire your boss is to have other options. The key to having other options is growing and developing yourself. Is it time to fire your boss? Checkout this episode to see how many of the 7 signs your boss is displaying. 106: 5 reasons leaders won't remove low performers. In this episode, I'll share 5 reasons why low impact leaders won't remove weak, low impact, toxic players from their teams. Toxic team members destroy the morale of their team. Low performers hold themselves, their team members, and their organization back. However, low impact leaders choose to let them contaminate their team day after day, week after week, and often, year after year. For me, there was nothing worse than reporting to a leader who wouldn't remove the weak, low performing, toxic team members. These leaders were worried about themselves more than they were concerned about doing what was right for the team when it was right for the team. 105: Why should you acknowledge your weaknesses? In this episode, I share why it's important to acknowledge our weaknesses. I'll be sharing a story about the time I was in Guatemala with John Maxwell and an executive asked me, "If I tell my team my weaknesses, won't that make it harder for me to lead?" I said, "Sir, if you believe that you have a false assumption. You're assuming they don't already know your weaknesses." 104: Are you under construction? You should be! 103: A turnover problem below indicates a leadership problem above. 102: Everyone is a leader, a follower, and a manager. There's no need to keep trying to decide if you are a leader, a follower, or a manager. You are all three all the time. You are constantly leading and influencing others (leader), personally and professionally. You are constantly being led and influenced by others (follower), personally and professionally. You are constantly managing things and processes (manager), personally and professionally. 101: Do you know what's worse than training people and having them leave? When conducting leadership development training at organizations that haven't done anything like this in the past, I'm often asked by concerned managers and leaders, "What happens if we invest in training and developing the people and they leave?" I always say, "That's a great question. But, I've got a better question. What happens if you don't invest in training and developing the people and they stay?" What matters most is the development level of the people in the organization, not the development level of those who choose to leave. 100: Silent gratitude isn't much good to anyone. Are you leveraging gratitude to build trust with others which increases your influence with others? Henry Frederic Amiel stated, "Thankfulness is the beginning of gratitude. Gratitude is the completion of thankfulness. Thankfulness may consist merely of words. Gratitude is shown in acts." When it comes to high impact leadership of self and others, gratitude is character trait that reveals who you are on the inside to those on the outside. 99: Discover the "Two Types of Competition"
98: I hate the term "brown-nosing"...let me tell you why. High impact players who are making things happen at work are often ridiculed by their teammates. Those doing the ridiculing are insecure and attempting to prevent others from moving to the next level and beyond because they don't want to be left behind and/or they don't want to do the work to move themselves ahead. So what do they do? They ridicule others in an effort to slow them down. Don't do it. And, don't let others do it to you. 97.1: Are you actively using LinkedIn? You should be! (Note: This is a second attempt to release this episode across all platforms. It was limited the first time as episode 96 for unknown reasons.) In this episode, I'll share "why" and "how" you should be using LinkedIn to grow your professional network and advance your career to the next level and beyond. When it comes to LinkedIn, many people don't know what they don't know. Facebook, Instagram, and other similar social media platforms are fine for sharing about your personal life. But, LinkedIn is the professional platform where you are most likely to advance your career, let people know what you know, express your interests, connect with people who value who you are professionally. LinkedIn is simply an online resume making you visible to the world at worst, but a large professional platform to be used for growth and development, networking, and job hunting through relationship building, at best. 97: Don't let average people keep you average. Average is a relative term. In this case, it means those people you hang around and associate with by choice. Average people want to keep us average. Only exceptional people want to and are capable of helping us climb to the next level and beyond. To get to the next level and beyond, you will most likely have to leave some people behind, not because you are better than them, but because you are heading in a different direction. 96: Are you actively using LinkedIn? You should be! In this episode, I'll share "why" and "how" you should be using LinkedIn to grow your professional network and advance your career to the next level and beyond. When it comes to LinkedIn, many people don't know what they don't know. Facebook, Instagram, and other similar social media platforms are fine for sharing about your personal life. But, LinkedIn is the professional platform where you are most likely to advance your career, let people know what you know, express your interests, connect with people who value who you are professionally. LinkedIn is simply an online resume making you visible to the world at worst, but a large professional platform to be used for growth and development, networking, and job hunting through relationship building, at best. In this episode, I'll share The Transformation Equation with you. You'll discover the 5 Foundational Components of Transformational Leadership. Organizational transformation is about attaining long-term, positive, and fundamental improvement that goes far beyond short-term initiatives and change management. However, leading transformation requires key components. When one of the key components is missing, the organization will experience frustration, resistance, confusion, anxiety, or stagnation. 94: If you won't bet on yourself, why should anyone else? 93: If you won't invest in yourself, why should anyone else? Blue-Collar Leadership: Leading from the Front Lines Part 29 of 30. Develop yourself intentionally. Growth doesn't just happen. You must be intentional and make it happen. Accidental growth vs. intentional growth is about as effective as accidental exercise compared to intentional exercise...not even close. And the results...not even close. 92: Working hard doesn't guarantee success, and hope isn't a strategy. 91: When you pay attention to the details, people will pay attention to you. Blue-Collar Leadership: Leading from the Front Lines Part 27 of 30. Do it better than expected. Doing things better than expected increases your influence; doing things worse than expected decreases your influence. As George Washington Carver said so well, "When you do the common things in life in an uncommon way, you will command the attention of the world." 90: The wise does at once what the fool does at last. Blue-Collar Leadership: Leading from the Front Lines Part 26 of 30. Do it better than expected. Doing things sooner than expected increases your influence; doing things later than expected decreases your influence. Making it happen is great, but making it happen sooner than expected can pay huge in the influence department. Why? Because you're building trust. 89: Never mistake effort and intentions for results. Blue-Collar Leadership: Leading from the Front Lines Part 25 of 30. Do more than expected. Doing more than expected increases your influence; doing less than expected decreases your influence. As St. Francis of Assisi stated, "Start doing what is necessary; then, do what is possible; and suddenly, you are doing the impossible." 88: Everyone remembers the first to help, few remember the second. Blue-Collar Leadership: Leading from the Front Lines Part 24 of 30. Helping others always helps you. If you want to increase your influence, always be the first to help. Everyone remembers the first to help, few remember the second. With people, the little things are the big things. As Ria Story says, "Those who have a heart for serving others in some way will build influence far beyond those who expect to be served." 87: If you're not familiar with abundance and scarcity, this episode is for you. Blue-Collar Leadership: Leading from the Front Lines Part 23 of 30. Helping others succeed ensures you will succeed. There's enough for everyone. There's plenty of everything for everyone. A person with an abundance mindset shares knowledge and ideas. As a result, they increase their value and their influence. A person with a scarcity mindset hoards knowledge and ideas. As a result, they decrease their value and their influence. Abundance is a choice that only secure people will make. 86: Don't accept responsibility; take responsibility. Blue-Collar Leadership: Leading from the Front Lines Part 22 of 30. Ask for more responsibility. When you accept more responsibility, you will gain more influence. When you take responsibility, you will maximize your influence. Leaders are always looking for team members who don't avoid taking responsibility. 85: Be confident but not cocky. Blue-Collar Leadership: Leading from the Front Lines Part 21 of 30. Think of yourself less. There's a fine line between arrogance and confidence. It's called humility. As Ken Blanchard says, "People with humility don't think less of themselves. They just think about themselves less. Arrogant people create distrust. Confident people build trust. 84: Be prepared to listen, and listen to be prepared. Blue-Collar Leadership: Leading from the Front Lines Part 20 of 30. Seek first to understand. You will always learn more from listening than from speaking. If you truly want to increase your influence, slow down, pause, and choose to listen first. When you do, you're allowing the other person the courtesy of influencing (leading) you first. Once others feel completely understood, they are far more likely to listen to you and accept your influence. However, if others don't feel understood, they're not listening at all. They are waiting for you to quit talking, so they can start talking. Instead of listening with the intent to understand, they are listening with the intent to reply. 83: 5 ways high impact followers increase their influence. Blue-Collar Leadership: Leading from the Front Lines Part 19 of 30. Followers choose leaders. A low impact follower does less than expected alone. A high impact follower does more than expected with others. All great leaders were first great followers. As Truett Cathy, Founder of Chick-fil-A, said so well, "To excel in leadership, you must excel in followership." 82: Positions are overrated...if you can't lead without a position, you won't lead with a position. Blue-Collar Leadership: Leading from the Front Lines Part 18 of 30. Bosses make things happen with people who have to help them. Leaders make things happen with people who want to help them. As USMC Lt. General George Flynn remarked, "The cost of leadership is self-interest." High impact leaders know it's not about them. But, they also know it starts with them. They know others will choose to follow them because of who they are and how they make others feel. 81: Discover the difference between a boss and a leader. Blue-Collar Leadership: Leading from the Front Lines Part 17 of 30. Leaders always have followers. If others aren't following because they want to, there is no leadership. It's easy to tell whether you work for a boss or with a leader. You can tell because of how they make you feel. In this episode, I compare and contrast how bosses and leaders make their team feel. Bosses value position and power over others which is based on formal authority. Leaders value positive influence with others which is based on moral authority. No one wants to work for a boss. Everyone wants to work with a leader. 80: You can't get to the top of the mountain with base camp character. Blue-Collar Leadership: Leading from the Front Lines Part 16 of 30. Character trumps competency. What you know matters. But, who you are matters most. Your character serves as a multiplier and leverages your competency. You have far more than you need to succeed on the outside because it's provided for you. The question is, "Do you have what you need to succeed on the inside?" Who you are and what you know is an inside job. And, you're fully and completely 100% responsible for that job. 79: Who you are on the inside is what others see, feel, and experience on the outside. Blue-Collar Leadership: Leading from the Front Lines Part 15 of 30. Character counts, and it counts A LOT! Your character will either limit you like an anchor or launch you like a rocket. Henry Cloud said it best, "Character is the ability to meet the demands of reality." Character is about much more than being a good or bad person. Character does determine if you're a good or bad person. However, character is about much more than being good or bad. Character is about how you do what you do and why you do what you do. Character is everything that you are. 78: Those who like you the most are the most like you. Blue-Collar Leadership: Leading from the Front Lines Part 14 of 30. We attract who we are. Then, if we don't become intentional about growth and development, we get caught up in a vicious circle. Why? Because we become the average of the five people we voluntarily hang around the most. It's true! We start talking like they talk, acting like they act, dressing like they dress, eating what they eat, drinking what they drink, doing what they do, and most importantly, we begin thinking like they think and believing what they believe. And ultimately, we'll end up getting the results they get. 77: Courage allows average people to achieve exceptional results. Blue-Collar Leadership: Leading from the Front Lines Part 13 of 30. Courage is contagious. As Anais Nin stated, "Life shrinks or expands in proportion to one's courage." Often, what's holding us back is the courage to stand alone and do what's right based on who we are and where we want to go. In the blue-collar workforce, it's far too easy to be influenced by those around us who aren't interested in going where we want to go. I can tell you this. Just as average people want you to remain average just like them, exceptional people want to help you become exceptional. 76: You can't predict your future, but you can create your future. Blue-Collar Leadership: Leading from the Front Lines Part 12 of 30. The future is in you now. If you don't choose your future, someone else will. We create our future one choice at a time. For instance, something happens. Then, we respond. We could respond four different ways. Each way will create a different future. When we know the future we want to create, we can simply align our choices to create that future. When we do, our preferred future will eventually become our reality. 75: If you do not conquer self, you will be conquered by self. Blue-Collar Leadership: Leading from the Front Lines Part 11 of 30. The power of the pause button. Between stimulus and response, we all have the freedom to choose our response. But, many times we don't pause and benefit from that freedom. When something happens do you respond based on feelings or values? Does it matter? Absolutely! 74: The face you see least is your own. Blue-Collar Leadership: Leading from the Front Lines Part 10 of 30. Focus on the mirror. The face you see least is your own. Earl Nightingale said it best, "A man's environment is a merciless mirror of him as a human being." Until we go within, we will go without. We all have a blind spot, and it's in the exact same place: between us and the mirror. We don't know about ourselves what we need to know about ourselves. 73: You should always be grateful but never satisfied. Blue-Collar Leadership: Leading from the Front Lines Part 9 of 30. Your potential is unlimited. You should always be grateful but never satisfied. However, the opposite is often true. Too many people are ungrateful and may or not be satisfied. You may have heard, "If Bob has a problem everywhere Bob goes, then Bob is the problem." The key to unleashing your potential is to first realize it's your responsibility to do so. If you don't lead yourself intentionally, you'll be led by others automatically. 72: You're always teaching what you're modeling, regardless of what you're teaching. Blue-Collar Leadership: Leading from the Front Lines Part 8 of 30. The question isn't, "Are you a role model?" but rather, "What kind of role model do you want to be?" because somebody is always watching. When you touch a life, you don't always feel it. We're all touching lives everyday. Most often we don't even know it. And, we're touching the lives of others in positive and negative ways as we go about our day. Albert Einstein said it best, "Example isn't another way to teach, it's the only way to teach." When people look at you, what do they see? Who we are matters...and, it matters A LOT! 71: Discover the secret to your success. Blue-Collar Leadership: Leading from the Front Lines part 7 of 30. Who do you work for? Notice, I didn't ask, "Where do you work?" or "Who pays you to work?" The secret to your success is understanding this: You get paid by others, but you're working for yourself. When you truly understand what I'll be sharing in this episode, you'll change what you do. When you change what you do, you'll change what you get. 70: You don't have to be sick to get better. Blue-Collar Leadership: Leading from the Front Lines part 6 of 30. Are you intentionally doing something everyday to get better? You should be. If you aren't, you're likely to be passed by someone who is. The only person you need to be better than tomorrow is the one you are today. There is no external competition preventing you from climbing to the next level and beyond. The battle you need to win is on the inside, not the outside. In this episode, I'll share a simple question that you can leverage to achieve amazing results. The key is having the self-discipline to take the right action based on the answer to the question. 69: There is an "I" in Team! Blue-Collar Leadership: Leading from the Front Lines part 5 of 30. Every team is made up of "I"ndividuals. To grow and develop a high performance team, we must begin by growing and developing the individuals on the team. To develop the character of the team, we must develop the character of the individuals on the team. 68: Common sense isn't always common practice. Blue-Collar Leadership: Leading from the Front Lines Part 4 of 30. Common sense is never enough. Often, you must also have uncommon sense to do what is commonly understood. As George Washington Carver stated so well, "When you do the common things in life in an uncommon way, you will command the attention of the world." 67: You're exactly where you're supposed to be, but not where you have to be. Blue-Collar Leadership: Leading from the Front Lines Part 3 of 30. You're in the perfect place to begin climbing to the next level and beyond. However, too many people fail at getting started. Taking action is the key to getting from where you are to where you want to be. It's much easier to go from failure to success than it is to go from excuses to success. Why? Because those who are "failing" are actually doing something. Those who are making excuses aren't doing anything. Make it happen or someone else will. It might as well be YOU! 66.1: It's been 4 months since I started this podcast. Thank you for listening! I started the Blue-Collar Leadership Podcast on July 19, 2018. 4 months later, thanks to you, the episodes have been played 5,299 times averaging nearly 80 plays per episode. 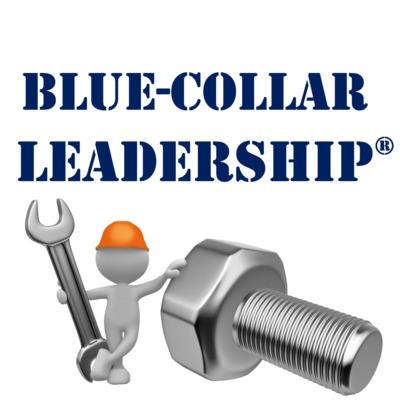 If you find value in this podcast, please share a link on your social media pages and consider leaving a 5 Star review on your podcast app to help make the Blue-Collar Leadership podcast more visible to the world. Thank you for listening and for helping me spread the Blue-Collar Leadership message! 66: Believing in others helps them believe in themselves. Blue-Collar Leadership: Leading from the Front Lines Part 2 of 30. Motivation comes from the outside, but inspiration comes from the inside. When we're able to motivate others from the outside by believing in them, they're positioned to become inspired from within and to begin believing in themselves. In this episode, I invite you to change the way you believe in others by redefining the way we should express our belief in others. 65: Intro to Blue-Collar Leadership: Leading from the Front Lines. Blue-Collar Leadership: Leading from the Front Lines Part 1 of 30: I wish someone would had given me a copy of Blue-Collar Leadership: Leading from the Front Lines, 30 years ago when I started my career on the front lines. However, it didn't exist then. It didn't exist until I wrote it in 2016. If it had been available in 1988, it would have changed my life and helped me accelerate my career. However, it is available today and can help you change your life now and help you accelerate your career. In the opening episode of this series, I will tell you why I wrote Blue-Collar Leadership, who I wrote it for, what you can learn from it, and I'll share a short story about my first manufacturing job, so you'll know: I'm one of you. Who we are matters! 63: If you'll invest in your blue-collar workforce, so will I. 62: The organizational chart reveals management not leadership. Many make the mistake of believing the organizational chart reveals who the leaders in an organization are. The organizational chart reveals who the managers are. Those on the chart may or may not be high impact leaders of people. However, they are definitely managers of things and processes. Managing People vs Leading People series Part 17 of 17. Managers of people go fast to go slow. Leaders of people go slow to go fast. Leaders of people take the time it takes, so it takes less time. Managing People vs Leading People series Part 16 of 17. Managers of people transfer responsibility, blame others, and create distrust among their team. Leaders of people take responsibility, blame themselves, and build trust with their team. Managing People vs Leading People series Part 15 of 17. All of our growth happens outside of our comfort zone. Managers of people seek to remain in their comfort zone while leaders of people seek to move beyond their comfort zone. Managing People vs Leading People series Part 14 of 17. Managers of people want to travel existing roads where everything is familiar. Their goal is to maintain the status quo. Leaders of people want to explore and create new paths. They prefer and expect things to change and seek continuous improvement. Managing People vs Leading People series Part 13 of 17. When things go wrong, managers of people are quick to "look out the window" for someone to blame and create distrust with others. However, when things go wrong, leaders of people are quick to "look in the mirror" and take the blame which builds trust with others. Managing People vs Leading People series Part 12 of 17. Managers of people look for opportunities to take the credit and create distrust with others. Leaders of people look for opportunities to give credit to others and build trust with others. Managing People vs Leading People series Part 11 of 17. Managers of people grow slowly and accidentally while avoiding growth beyond what is required. Leaders of people grow quickly and intentionally while growing far beyond what is required. Managing People vs Leading People series Part 10 of 17. Managers of people are concerned with being right and allow their pride and ego to guide them. Leaders of people are concerned with doing what is right and allow their humility to strengthen them. Managing People vs Leading People series Part 9 of 17. Managers of people avoid conflict and hope it goes away without intervention. Leaders of people use conflict to strengthen relationships while growing and developing the character of those on their team in an effort to minimize and eliminate conflict before it becomes an issue. Managing People vs Leading People series Part 8 of 17. Managers of people avoid risk and attempt to maintain the status quo. They don't rock the boat and don't want others rocking the boat. They seek comfort. Leaders of people take smart risks. They know growth occurs outside of their comfort zone. As a result, leaders become comfortable being uncomfortable. Leaders understand embracing risk is simply another part of the journey. Taking a risk is often the next step. Managing People vs Leading People series Part 7 of 17. Managers of people thrive on controlling people and attempt to manipulate their team. Leaders of people exhibit passion, focus on releasing people, and attempt to motivate and inspire their team. Managing People vs Leading People series Part 6 of 17. Managers of people focus on making decisions. Leaders of people focus on facilitating decision making. A totally different mindset always leads to totally different results. Managing People vs Leading People series Part 5 of 17. Managers of people get their power from the "rights" that come with their position, title, or rank. Leaders of people get their power not from formal authority, but from moral authority which based on their character and the relationships they've built. Managing People vs Leading People series Part 4 of 17. Managers believe others are there to help them accomplish their mission. Therefore, managers attempt to manipulate others for personal benefit. However, leaders believe they are there to help others accomplish their mission. As a result, leaders attempt motivate others for mutual benefit. Managing People vs Leading People series Part 3 of 17. When it comes to looking in the mirror, managers of people see themselves one way while leaders of people see themselves a total different way. They believe they have completely different roles. The mindset of a manager is to be served by the team. The mindset of a leader is to serve their team. Managing People vs Leading People series Part 2 of 17. When it comes to change, managers of people have a very different perspective than leaders of people. Managers of people avoid change and seek to maintain the status quo. Leaders of people are focused on continuous improvement which requires constant change. Managing People vs Leading People series Part 1 of 17. Relative to vision, managers of people have a different perspective than leaders of people. Managers focus on the short term. Leaders focus on the long term. 44: It's not the millennials. It's the leaders! I find it interesting that the only people I hear complaining about millennials are low impact leaders. I've never heard a high impact leader complain about millennials. Why? High impact leaders don't have a problem attracting them, leading them, or retaining them. Low impact leaders have always blamed others for their inability to lead. It's always been that way, and it will always be that way. Young people have always been leading the way and carrying the bulk of the load in the US Military, and they still are. Our military hasn’t fallen apart because of millennials. Where’s the real problem? We don't have a new millennial problem. We have an old leadership problem. In this episode, I discuss the real problem with millennials: those leading them. Discover the traits of the 5 Types of Blue-Collar Leaders: Managerial, Relational, Motivational, Inspirational, and Transformational. I first wrote about the 5 Types of Leaders in my book, Defining Influence: Increasing Your Influence Increases Your Options. Be sure to checkout the audio version if you want to take a deep dive and discover how to become more intentional about increasing your authentic influence with others at all levels...360° from wherever you are whether you have a position of authority or not. 42: Bosses have workers. Leaders have followers. It's my pleasure to share some wisdom from my personal friend and mentor, Jimmy Collins. Jimmy retired as President and COO of Chick-fil-A in 2001 when Chick-fil-A reached $1 Billion in annual sales. Today, they are at or near $8 Billion. Jimmy retired after 33 years of following Chick-fil-A's Founder, Truett Cathy. In this episode, I'll introduce you to Jimmy's great book, Creative Followership: In the Shadow of Greatness. It's packed full of golden nuggets of wisdom and some really interesting stories. Apply what's in it, and you will absolutely increase your influence with high impact leaders as you intentionally climb your way to the next level and beyond. When you do...you'll also increase your options. 41: Management & Manipulation vs. Leadership & Stewardship. In this episode, I share a great quote related to "Managing vs. Leading" by Bob Chapman who is the CEO of Barry-Wehmiller and author of Everybody Matters. He is the best example of a high impact leader at the CEO level that I'm aware of at the moment. He has raised the bar on what high impact leadership looks and feels like. Bob leads a $2 Billion global organization made up of over 10,000 team members: an amazing blue-collar workforce, those who lead them, and those who support them. 40: One of those times when I let my team down. A little over 10 years ago, I was leading a process improvement (kaizen) team. The goal was to clean, paint, and organize a large area in our manufacturing plant. One of my responsibilities as the team leader was to obtain the paint for the team, so they could paint the entire area on Thursday of the event week. However, I failed to get the paint on time. As a result, I chose to work overnight, a 26 hour shift, and paint the entire area myself to make up for my lack of planning and poor leadership. I was able to turn the negative into a trust building positive. 39: Two great lessons that I learned from my co-worker. Leadership is more caught than taught. The two lessons I share with you in this episode were not taught to me. They were modeled for me by a fellow front line, entry-level team member in 1995. He modeled giving credit when things went right and taking the blame when things went wrong. 38: What you think about is more important than what I say. What you think about and the action that flows from your thoughts are far more important than anything you will read or hear. When you hear or see something that makes you think at a deeper level, don't just nod your head in agreement. Ask yourself, "How can I apply the principle in my life? And, when can I apply it?" If you want to get to the next level and beyond, you must then take action. Secure leaders eliminate problems. Insecure leaders cause problems. To better understand secure leaders, let's look at 7 Problems Insecure Leaders Cause. Discover the 10 Foundational Elements of Intentional Transformation: How to Become Your Best Self. 35: Increasing your influence increases your options. Introduction to my book, Defining Influence: Increasing your influence increases your options. Ria and I just finished up two 1/2 day workshops on this book with the US Navy in San Diego, CA. This episode is an overview of what the book is about. 34: Focus on the leaders. Where do high impact leaders invest most of their time and energy? With low performers? Or, with high performers? And most importantly, why? 33: Introduction to "MAXIMIZE Your Potential"
Ria and I had a great time today in San Diego, CA supporting the US Navy with two workshops on my book, "MAXIMIZE Your Potential." 32: San Diego bound to conduct 10 workshops for the US Navy! Ria and I are excited to be heading to San Diego today to serve those who are serving us. We'll be conducting 10 1/2 day workshops for the U.S. Navy. When leaders are willing to invest in their team, we are willing to invest in their team. We pay all of our travel expenses and offer up to 4 hours on site, complimentary leadership development speaking/training in any of the 50 states with each 200 book purchase. Learn more during this episode or check out the special offer page on the www.BlueCollarLeadership.com website. 31: Are you going to settle for success? I hope not! 30: Discover when to work on your strengths and weaknesses. When it comes to climbing to the next level and beyond, you should focus on developing your strengths in the area of competency and developing your weaknesses in the area of character. You will always excel in the areas where you are naturally talented and gifted relative to skills and abilities. Your character will play a key role by launching you or limiting you. 29: The difference between a practice and a principle. Knowing the difference between a practice and a principle is critical to personal development and to process improvement. When you hear someone say, "That won't work here," you know they're talking about the practice and are overlooking the principle. A practice only works in certain situations. However, a principle works in all situations. 28: 3 simple tips to help you advance to the next level. Wake up! The world isn't holding you back. You are. The sooner you figure this out, the sooner you'll reach the next level. 3 simple tips that will help you advance to the next level and beyond. 27: Are you unlucky? I'll help you learn to be lucky. I've heard it said many times, "Luck is where preparation intersects opportunity." I agree. If you want to be lucky, prepare yourself for the opportunities you want. We make our own luck by being prepared. 26: One way to stand out when applying for a new job. Who is going to get the job you want? The person with the most influence. Not sometime, every time. Learn how to get someone to actually look at your resume/application when applying for a job internally or externally. 25: There's more to getting ahead than doing a great job. When it comes to launching yourself and your career, what you do at work is important; but what you do after work is more important. 24: The opportunity you want is waiting on you to show up. Too often, people who want a promotion, a better job, a different job, a better paying job, are simply going through the motions waiting for it to suddenly be given to them. That's not how it works. Someone will be hired tomorrow for the exact job you want. HR is filling that position somewhere everyday. The person who is best prepared relative to character and competency will get it. Will it be you? 23: Develop your mind or be controlled by those who do. Too many people are frustrated because they feel they are being controlled by others. However, we determine if others control us. It's pretty simple: If you don't develop your mind, you'll be controlled by those who do. You won't get to where you want to be accidentally. You must be intentional. What I learned from the 7 Habits. (Part 7) Are you intentionally focused on developing your character and your competency? I hope so because no one else is or ever will be. Personal development is an inside job...between you and you. High impact players and high impact leaders are always focused on continuous improvement. If you're not, you'll get passed up by those who are. 21: When there are differing opinions, don't compromise. What I learned from the 7 Habits. (Part 6) When there are differing opinions, too many people focus on compromising when they should be synergizing. Synergy means the whole is greater than the sum of the parts. 20: I lost my son for 4 years; here's how I got him back. What I learned from the 7 Habits. (Part 5) The key to influencing others is to first allow them to influence you. As Stephen R. Covey said, "Seek first to understand, then to be understood." It's okay to let others go first. When they feel like you understand, it's much more likely they'll listen to what you have to say. However, if they don't feel understood, it's much more likely they'll be focused on responding instead of listening. 19: Helping others win causes them to help you win. What I learned from the 7 Habits. (Part 4) Think Win-Win. Zig Ziglar said it best, "If you'll help people get what they want, they'll help you get what you want." The key is valuing helping other people win. Instead of focusing on ourselves, we must learn to focus on others. Peyton Manning said it a different way, "The most valuable player is the player that makes the most players valuable." 18: There's no such thing as time management. What I learned from the 7 Habits (Part 3 of 7). Once you know who you want to be and where you want to be, you must "Put First Things First" and manage yourself within time toward your goal. There's no such thing as time management. You can't manage time and neither can anyone else. Time just is. There's only personal leadership and personal management within time. 17: Moving from where you are to where you want to be. What I learned from the 7 Habits (Part 2 of 7). Who are you? Where are you? Who do you want to be? Where do you want to be? If you know the answer to these questions, you'll discover there's a gap between the first two and the second two. I call that the "Success Gap." How do you close the gap? You "Begin with the End in Mind." 16: The most important principle I've ever learned. What I learned from the 7 Habits (Part 1 of 7). In this episode, I share the most important leadership principle I've ever learned. Learn what it means to "Be Proactive" instead of being reactive. Learn how and why you should focus on your "circle of influence" and why you should avoid your "circle of concern." 15: Introduction to the book that changed my life. What I learned from the 7 Habits (Intro). The first leadership development/personal growth book I was introduced to happened to be the one that inspired me to transform myself and my life. 10 years later, I've read hundreds of books. However, this one is still #1 on my list. Today, I've also published 12 books of my own and speak and train full-time all across the USA, and sometimes internationally, on leadership development and personal growth. After I introduce this book today, I'm going to record a 7 part series and share more details about it. I hope what I share in the series will help you as much as it helped me. 14: That time a front line guy wanted to cut my throat. Want to learn what made a front line factory worker I had never met say to me, "I want to cut your damn throat!" If so, take a listen. The short answer: poor leadership from above. Intention is the foundation of trust. Just as we decide how we feel about others, they decide how they feel about us. If they feel we are attempting to use and manipulate them only for our benefit, we create distrust. If they feel we are trying to help and motivate them for mutual benefit, we build trust. What is trust? Most people haven't really thought about it. When I ask my audiences this question, most often I get silence. Then, a few people will say things like honesty, dependability, confidence in others. That's all true. But, there's a lot more to trust than that. Today, I'll explore the two pillars of trust briefly: character and competency. 11: Trust is the foundation of influence. The key to establishing authentic influence it to first establish trust. The more trust you have with others, the more influence you will have with them. Authentic influence is always better than artificial influence. Here's a story from the shop floor to illustrate just how important establishing authentic influence can be. The boss told me I would need an interpreter to speak to the people in one of his departments because none spoke English. However, they always spoke English to me. Authentic influence is based on moral authority, your character. Artificial influence is based on formal authority, your position, title, rank, etc. Authentic influence is always better than artificial influence. John C. Maxwell said it best, "Leadership is influence. Nothing more. Nothing less. Everything rises and falls on leadership." A few thoughts on one of the most important things I learned from John Maxwell. 7: If we won't invest in ourselves, why should someone else? A few simple thoughts about what it means to invest in yourself. If you're in the blue-collar workforce, odds are your employer will develop you to do the job because that's required. However, they aren't likely to develop you beyond what's required. If you want to climb to the next level and beyond, start intentionally investing in yourself. If you do, you'll quickly separate yourself from the crowd. In this episode, I talk a little about passion, purpose, and sacrifice as I share a little about my transition from Lean Manufacturing/Process Improvement Consultant to Motivational Speaker/Trainer/Coach/Mentor. And, I get a little fired up talking about investing in ourselves. If we won't invest in ourselves, why should anyone else? 5.1: Blue-Collar Leadership & Teamwork is on now on audio. JUST RELEASED ON AUDIO: My newest book, Blue-Collar Leadership & Teamwork: 30 Traits of High Impact Players was just released on audio at Audible.com and will be on iTunes and Amazon too in a few days. Learn how stepping away from the corporate world (my "J-O-B") to follow my passion for leading lean/process improvement teams created the space I needed to discover my purpose: teaching and speaking about leadership development and personal growth. In Part 3, I share a little about the impact choosing to invest my time to earn a 4 year degree while working 6-7 days a week 10, 12, 14, and even 16 hours a day. However, it took me about 7-8 years to get that 4 year degree. But, it served its purpose. It served as the key to a door that I wanted to open. Learn a little about the beginning of my career at my second manufacturing plant where I started operating, band saws, CNC lathes, mills, drills, and gear shapers. Learn how my blue-collar journey in manufacturing began in 1988. 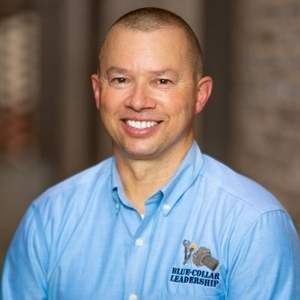 Mack Story introduces the Blue Collar Leadership podcast!